Philips Speech Processing Solutions is an international electronics company with a plethora of devices used in the Dictation, Transcription, Enterprise and Speech Recognition market today. Founded in 1954, Philips SPS has been around the block and is no stranger to the every so changing needs and demands within the voice processing industry. They started out making mini-cassettes for their early analog Pocket Memo’s then in the late 90’s, they, along with Grundig and Olympus established the International Voice Association, which defined the Digital Speech Standard (DSS) format still used today in all of their Digital Pocket Memos. Today, Philips SPS provides several scalable solutions to cover just about vertical and voice processing need in the industry. For novice users, Philips recently released an entirely new lineup of Digital Voice Tracers. The Philips Digital Voice Tracers are entry-level recording devices and are more interesting than ever as they provide a number of unique features. Whether you’re just interested in taking notes, recording conversations, lectures, music or meetings, there’s a Philips Voice Tracer optimized specifically for that purpose. Choosing the right device is the key to success. There are currently 7 new models of Digital Voice Tracers to choose from. The DVT-1000 and DVT-1500 are designed for note taking and feature a 2Mic Stereo Recording System. The DVT-3000 and the DVT-3500 are designed and optimized for recording conversations with built-in Auto Adjust recording features. 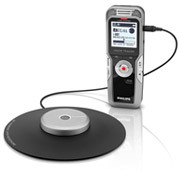 The DVT-5000 features a 3Mic Auto Zoom System, designed for recording Lectures, whereas, the DVT-5500 is optimized for recording music and features a wireless remote control, adjustable microphone sensitivity option and even has a built in stand. 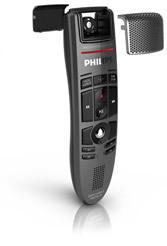 Last in this line, but certainly not least is the Philips DVT-7000, designed for recording meetings, it features a 360 degree meeting microphone, a wireless remote control and even comes with an expandable array microphone system. Although Philips Digital Voice Tracers are great for essential recording needs, they lack several professional features authors need to maintain efficiency and security while dictating. Intermediate users should consider the Philips Digital Pocket Memo product line. This line is separated into two categories, Consumer and Professional. The consumer line of Philips DPMs consists of the LFH-9375 Digital Pocket Memo and the Philips LFH-9380 Digital Pocket Memo. The Philips 9375 DPM or 9380 DPM are both great choices for entry level authors because they include several features not found in the Digital Voice Tracer line such as Lightweight Metal Body, Workflow Management Software (SpeechExec Dictate), Ease of Use with larger buttons, DSS Compatibility, Direct Charging via USB for economical recording, Automatic file download, Voice-Activated recording, Exchangeable memory for unlimited recording capabilities and Priority settings. The Professional Digital Pocket Memo product line, consisting of the Philips LFH-9500 and the LFH-9600 are the top of the line professional dictation devices and have somehow managed to make the impressive list of features found in the consumer line seem insignificant. Professional authors, like doctors and lawyers have a strong need for security, automation and advanced workflow options and that’s exactly what the Pro-line of Philips DPMs deliver, along with a few other fancy bells and whistles. For starters, Professional Digital Pocket Memos are packaged with the Philips SpeechExec Professional Dictate software, which truly provides a multitude of advanced workflow, routing and automation options that can be fully customized to meet the needs of the individual users. Real-time Encryption, Superior Audio quality with the available DSSPro (.DS2) format, Voice Command, Noise Reduction, Docking station and Barcode scanning are a few of the other advantages that have propelled the LFH-9500 and LFH-9600 into the professional category. As Philips takes pride in offering a complete range of products and solutions to fit every need, there’s also the Philips Dictation Recorder App for Smartphone users. Now iPhone, iPod, iPad, Android and BlackBerry users can enjoy the benefits of productivity by turning their Smartphone into a means of capturing audio while on the go. The Philips Dictation Recorder for Smartphones fits perfectly into the Philips SpeechExec Professional software suite and allows users to record, edit and send dictation files from their mobile device. We’ve discussed a nice variety of mobility options but certainly haven’t forgotten about our static users which brings us to the ever so popular, Philips SpeechMike. 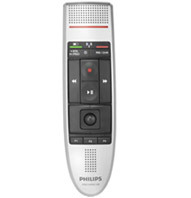 The Philips SpeechMike is a hand-held USB microphone with programmable buttons that can be fully customized. The Philips SpeechMike is a popular choice for Dragon Medical Practice Edition and Dragon NaturallySpeaking users as it provides an extra layer of convenience by allowing users to automate various speech recognition features with the press of a button. The first Philips SpeechMike was the LFH-6174 introduced in 1996 giving Philips Speech Processing Solutions 17 years to perfect this technology and it certainly shows with their recently released Philips LFH-3500 SpeechMike Premium, in my opinion, the best noise-cancelling handheld microphone currently on the market. The Philips SpeechMike Premium takes dictation to the next level with its free-floating studio quality Precision microphone and features like built-in noise-reduction pop filter, antimicrobial surface and the world’s first motion sensor in a stationary digital dictation device have made this microphone a must have for clinicians. Just because you’re stationary doesn’t mean you have to be tethered to your computer as Philips also offers a Wireless Bluetooth SpeechMike. Appropriately named, the Philips SpeechMike Air offers the convenience of a hand-help programmable USB Microphone but without the cord. Like their corded counter partner, the Philips LFH-3000 SpeechMike Air is geared for speech recognition, but can be fully integrated into existing workflow systems, EHRs or document management systems. 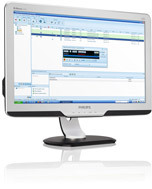 Packaged with the Philips Speech Control Application, users can easily program the buttons on their PC or Mac computers. The unique features of SpeechMike Air is the high connection reliability, low power consumption and expedited data transfer rate. Utilizing Bluetooth technology, authors can securely dictate up to 33 feet away from while having piece of mind knowing their voice data is encrypted. Now that you have a good idea of some of the Philips hardware solutions available, let’s talk about the software that brings it all together. In addition to the above referenced Philips SpeechExec and SpeechExec Professional software, Philips answers the dreams of IT professionals with the SpeechExec Enterprise solution. We’ve reviewed a lot of products here with the goal of providing you with an in-depth overview of the available voice processing devices and software offered by Philips Speech Processing Solutions. We could go on for a while as we didn’t even touch on the transcription devices, analog products or the long list of available accessories, but we’ll save that for a later time. As you’ve probably gathered by now, we at Certified eSupport are well versed in all of the software and hardware devices offered by Philips Speech Processing Solutions. We know the products better than anyone and have decades of experience working with these solutions and customizing them to fit the individual needs of our clients. Let us be your partner. We offer affordable, annual support & maintenance packages to ensure you get the help you need. Contacts us today to learn more about how we can help you improve financial performance, raise the quality of care and increase customer satisfaction.